Eclipse Automation is proud to announce the opening of a new facility in Cambridge, Ontario and the addition of over 120 high skilled team members this year to accommodate rapid growth. Strategically located at 385 Thompson Drive, the new facility will add additional 30,000 sq. ft. of much needed manufacturing space, expanding the company’s machining and assembly capabilities. This latest addition will be operational in Mid- December 2017 and will help to unify the company’s offerings, support current and upcoming automation contracts and reinforce Eclipse’s commitment to local manufacturing. 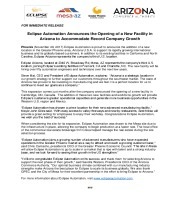 Eclipse’s workforce has exceeded 300 members this year, operating through 9 facilities within Cambridge, Ontario, Canada and in Arizona, California and North Carolina, U.S.A.
“We are really pleased with the overall success of the strategic locations we’ve chosen throughout North America and the ability to find some of the top talent in the world. Due to our dynamic industry capabilities and diversification, the overall response has been very positive leading to 45% increase in our workforce. As Eclipse continues to grow we will be looking for an additional 100 new hires for 2018” Steve Mai shares. 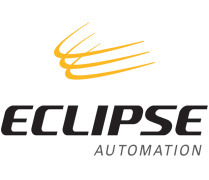 Eclipse Automation is a leading supplier of custom automated manufacturing equipment for the Life Sciences, Nuclear, Transportation, Mining/Energy, Industrial/Consumer, and Electronics/Telecommunications industries. Eclipse’s recent local expansion and record workforce growth enable the company to conceptualize, design, build, integrate, install and service any sized innovation project.